Gorilla Chief 2 comes from WMS and as the modern slot machine that it is, you’re going to find all sorts of cool features inside, along with a theme inspired by jungle wildlife. The Gorilla is obviously the most important creature of the jungle as far as this slot is concerned, but it’s not the only one to make an appearance. There are birds, lizards and other wild animals, along with fruits and flowers, all things that the jungle has to offer. 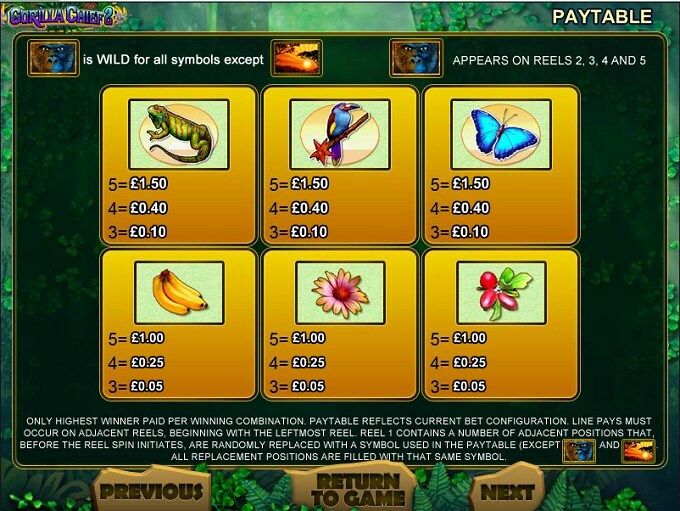 The 5 reels of this jungle themed slot host 50 paylines. On them, there are scatters and wilds, capable of triggering free spins and respins. The payouts don’t sound as good, the best one being worth $750. 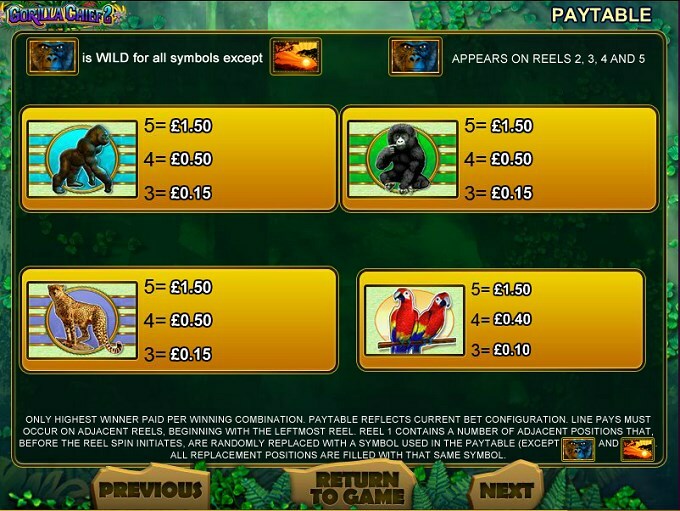 As far as features go, you can get wild symbols from Gorilla Chief 2, plus the scatters that can trigger free spins and even something called a Hot Hot Super Respin. The Gorilla is shown in multiple symbols, but the only one to have a close-up of its face is the wild, so it’s going to be an easy to recognize feature. The wild is only present on the last four reels, so since the 1st reel doesn’t get it, it can’t form its own combinations. It can be part of any other combo though, as long as it forms on paylines, which would exclude the scatter. Speaking of the scatter, that’s another symbol that can appear on a limited number of reels. The ones that can get the scattered Sunset are the reels 1, 2 and 3. 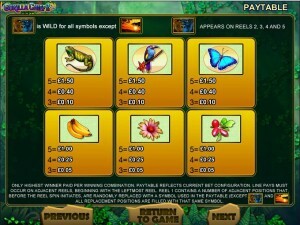 Get the symbol on all three reels, in the same round, and you will be given access to 10 free spins. 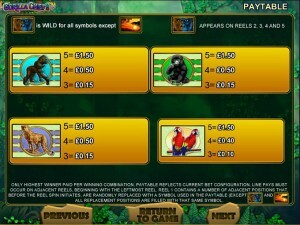 Extra wild Gorillas are added to the slot’s reels, for the duration of the 10 free spins. This feature can be retriggered, and an extra 10 free spins can be won with another 3 scattered Sunset icons. This feature needs to get a stacked symbol that takes over the entire first reel. When this happens, two respins are offered. The combinations formed during these respins are held in place, so that they offer the same prize in the next round as well. Though it has 50 lines, the game actually needs only 40 coins each round. 25 coins are used for the 50 lines, with an additional 15 coins for the feature bet. Since coins have a top value of $5, the wagers reach $200. The best prize here comes from about seven different symbols, which offer 150 coins, or $750 cash. It has an attractive design, with a fire like border surrounding the reels, probably thanks to the Hot Hot Penny feature which can get activated. The reels themselves are mostly in a light green, with various images of insects, birds, animals and plant life being presented on them. The background image shows off a waterfall image, with the surrounding jungle visible a bit as well. Symbols: Gorilla Close-up (wild), Sunset (scatter), Adult Gorilla (150 coins), Baby Gorilla (150 coins), Leopard (150 coins), Parrots (150 coins), Chameleon (150 coins), Toucan (150 coins), Butterfly (150 coins), Bananas (100 coins), Flower (100 coins) and Fruits (100 coins). The jungle theme has been done to death already, but there aren’t too many titles with a gorilla in the main role, so if you enjoy getting lots of smaller prizes instead of few big ones, this slot might be worth a try. 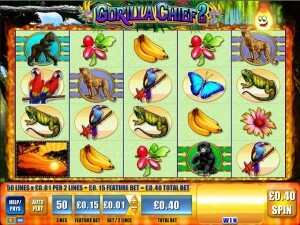 This Gorilla Chief 2 slot is offered by all online casinos with WMS software, playable either in practice or in real money mode.